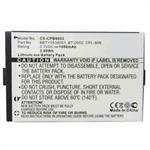 CPH-525 : 3.6volt 1000mAh NiMH battery for Nortel T7406E, 81010. Long-life rechargeable battery, made with premium-grade cells. X-ref #s CPH-525, NT8B45AH, 95AAAHCC3BXZ, CS-NTL740CL. These battery packs are MADE IN USA by BATTERIES AMERICA. Option: Choose eneloop 950mAh Pre-Charged NiMH for $5 extra. Eneloop NiMH cells are specially formulated to RETAIN THEIR CHARGE when not in use. CPB-403J : 3.6v 400mAh rechargeable NiCd battery for V-Tech, AT&T, Southwestern Bell, and other cordless phones. Replaces CPB-403J, AT&T 24312, AT&T 24112, BP-T37, CTP8210, BT-17333, BT-27333. See full x-ref list for compatibility. 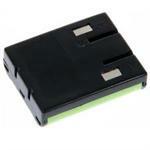 CBC318 : 3.6 volt 1100mAh rechargeable Ni-Cd battery (#89302) for Cordless phones (3 x AA cells & Black conn.). 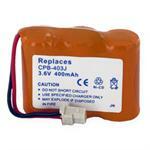 CBC318: 3.6 volt 1100mAh Rechargeable battery pack for Cordless phones. X-ref # 89302. Upgrade to 1650mAh NiMH for $6 extra. Upgrade to 2000mAh eneloop (PRE-CHARGED)for $10 extra. Upgrade to 2550mAh eneloop for $16 extra. BT-1015 : 2.4 volt 700mAh NiCd battery for Uniden cordless phones. Made with SANYO cells! BT-1015 : 2.4 volt 700mAh NiCd battery for Uniden cordless phones. Replaces BT1015, BT-1015, BT904, BP904, BT1007, etc. Fits Uniden, Sony, Panasonic, Radio Shack, Southwest Bell phones (see x-ref list). BT-1016 : 2.4 volt rechargeable NiMH battery for Uniden cordless phones. Made of 2xAAA batteries & Black connector. Choose 750mAh, 800mAh eneloop, 1000mAh, or 950mAh eneloop Pro. MADE IN USA by BATTERIES AMERICA !! P-P301 : 3.6 volt 400mAh rechargeable Ni-Cd battery w/ Black connector for Cordless Phones. Replaces Panasonic P-P301 and many others (see website for x-ref). Made with premium-quality SANYO NiCd "2/3AA" size cells. Includes black connector. Sprint # 89302 (BT-905) Rechargeable battery pack for Cordless phones. Made with 3 x AA cells & Black connector. Fits MANY diferent models. Sprint # 89302 (BT-905) Rechargeable battery pack for Cordless phones. Made with 3 x AA cells & Black connector. Fits MANY diferent models (see x-ref list). P-P303 : 3.6 volt 400mAh Ni-Cd battery pack w/ White connector for Cordless Phones. Fits MANY Cordless Phones. P-P303 : 3.6 volt 400mAh rechargeable Ni-Cd battery pack w/ White connector for Cordless Phones. These Packs are manufactured by US with premium-quality SANYO NiCd cells. Replaces Panasonic P-P303 and many others (see website for x-ref). The T139 is a 3.6 volt 600mAh Ni-Cd rechargeable battery pack for Cordless Phones. MULTI-FIT model, fits SONY, V-Tech, AT&T, Southwestern Bell, Lucent, TOSHIBA, etc. BATT-1032 : 2.4volt 900mAh NiMH battery for Panasonic Cordless Phones. See x-ref list for compatible phones. 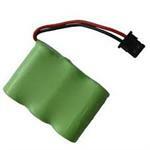 P-P511: 3.6v 1500mAh NiMH battery for Panasonic Cordless phones. P-P511: 3.6v 1500mAh NiMH Battery for Panasonic Cordless phones. Replaces original part # P-P511, HHR-P402, etc. The CBD909 is a 3.6 volt Ni-MH battery pack for cordless phones. Made with 3 x AAA cells & Black conn. Fits many Uniden phones (see x-ref.). Choose 720mA, 800mAh Eneloop, or 1000mAh. 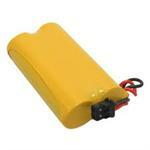 BT-1002 : 2.4volt 850mAh long life Ni-MH battery pack for Uniden cordless phones. Replaces the following battery model #s: BBTG0609001, BT-1008, BATT1008, BT-1016, BT-1021, BT-1025, and many more (see x-ref list). CBC909: 3.6v 720mAh Cordless Phone Battery (Ni-MH) for Uniden. Made with 3 x AAA cells & BLACK connector. CBC909: 3.6v NiMH rechargeable battery for Uniden cordless phones and more. Size: 1 3/4" x 1 1/4"; made with 3xAAA NiMH cells & BLACK connector. Upgrade to 800mAh or 1000mAh for extra $. CBD8003: 2.4v 800mAh Ni-MH rechargeable battery pack for V-TECH, SONY, Uniden cordless phones. Xref BT-1011. Made with 2xAAA NiMH cells & White connector. Choose 800mAh NiMH, 800mAh eneloop NiMH, 1000mAh NiMH, or 950mAh eneloop NiMH. 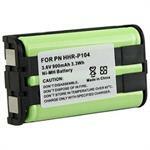 HHR-P513 : 2.4v 1500mAh long life Ni-MH battery pack for Panasonic cordless phones. 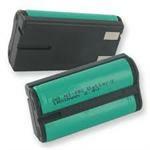 HHR-P107: 3.6v 800mAh rechargeable Ni-MH Battery for Panasonic cordless phones. Replaces HHR-P107, HHR-P107A/1B, Type 35, etc. Pack size: 2" long x 1 1/4" across. The BT-0003 is a 3.6v 900mAh long life Nickel Hydride Cordless Phone Battery for Uniden phones. Fits the following phones: CLX465, CLX475-3, CLX485, CLX502, TCX400, TCX440, UIP1869V, WIN1200. Replaces battery part #s BBTY0545001, BT-003. 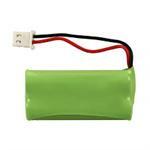 BT-446: 3.6v 900mAh long life rechargeable NiMH Battery for cordless phones. Fits Uniden, Radio Shack, GE, Bell South, etc. Includes BLACK connector. Replaces BT-446, etc. HHR-P105 : 2.4v 900mAh Cordless Phone Battery (Ni-MH) for Panasonic phones. HHR-P105: 2.4v 900mAh long life NiMH Battery for Panasonic cordless phones. Pack size: 2 1/8" long x 13/16" across. Replaces part #s HHR-P105, HHR-P105A, HHR-P105B. BT-999: 3.6v NiMH rechargeable Cordless Phone battery - fits Sony & V-Tech phones. Replaces BT-999, BP-999, BT-811, BT-815, BP-T23, & more (see x-ref list). P-P301h : 3.6 volt 700mAh rechargeable long life Ni-MH battery w/ Black connector for Cordless Phones. Replaces Panasonic P-P301 and many others (see website for x-ref). Made with premium-quality SANYO NiCd "2/3AA" size cells. Includes black connector. P-P303h : 3.6 volt 700mAh Ni-MH battery pack w/ White connector for Cordless Phones. P-P303h: 3.6 volt 700mAh rechargeable Ni-MH battery pack w/ White connector for Cordless Phones. These Packs are manufactured by US with premium-quality NiMH cells. Replaces Panasonic P-P303 and many others (see website for x-ref). HHR-P546 : 2.4 volt 1650mAh NiMH rechargeable battery for Panasonic, V-Tech, AT&T, Uniden, cordless phones etc. (see x-ref list). The BT-1007 is a 2.4 volt rechargeable NiMH battery pack for Cordless phones. 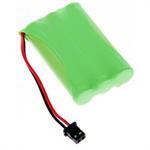 Standard capacity 1650mAh - $12.95. Upgrade to 2000mAh ENELOOP NiMH (PRE-CHARGED) for $6.00 extra. See X-Ref for fit models. HHR-P104: 3.6v 900mAh Cordless Phone Battery (Ni-MH) for Panasonic phones. HHR-P104: 3.6v 900mAh long life rechargeable NiMH battery for Panasonic cordless phones. Pack size: 2 1/8" long x 1 1/8" across. Replaces model #s HHR-P104, HHR-P104A, TYPE 29, FPG391. CBD958: 3.6 volt NiMH battery for Cordless Phone (AT&T, GE, SONY, etc). Made with 3 x AAA Ni-MH rechargeable cells & White connector. 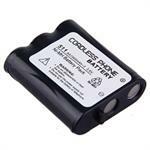 CBD958 : 3.6 volt rechargeable Ni-MH battery pack for AT&T, GE, SONY, & other cordless phones. Made with 3 x AAA size SANYO cells and White connector. HHR-P103: 3.6v 800mAh NiMH Battery for Panasonic cordless phones. Pack size: 1 3/4" long x 1 1/4" across (3 cells welded in plastic housing). Replaces model #s HHR-P103, HHR-P103A, etc. 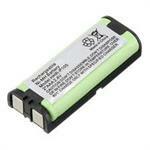 BATT-930: 3.6v 700mAh NiMH battery for cordless phone NEC, Nortel, Uniden, SONY, SW BELL, Toshiba. Replaces # BT930, NEC9300, 3S2-AAA65H-S-J.